Were the Egyptian pyramids wireless power stations? the pyramids were built to create "wireless electricity"
Is anything about it feasible? The video says (at 0:50) "electricity was originally generated and widely utilised in ancient Egypt, the Baghdad battery and the first arc lights were used at that time"
However the dates don't match up. Only a small number of these "Baghdad batteries" were discovered, by contrast the number of Egyptian mummies is in the millions. This isn't consistent with electricity being "widely utilised" in "ancient Egypt". At 1:18 the video claims "No soot has been found in the corridors of the pyramids" and this is used to suggest thet they therefore must have used electric lighting. However this is untrue, there is plenty of soot found inside the pyramids. Most of it from visitors in the 18th or 19th centuries, who used oil lamps and candles. When the pyramids were built, the chambers and passageways were constructed in the open, in daylight. The roofs of these spaces were only closed after the work on the spaces was mostly completed/ After that the upper layers could be placed. Reference. In ancient times, visitors were not permitted to enter the sealed tombs of the pharaohs. Once completed there was no need for lighting within. The video says "the arc lamp used in the lighthouse of alexandria is further proof that electricity was used in ancient Egypt, the energy required to power the lighthouse for 24 hours a day could only have been supplied by a regular electrical source"
This claim is made at 02:35.
however this is untrue - by any reasonable interpretation of "conductor" in the context of practical transmission of electrical current for powering, for example, a lighthouse. So granite is at least 10,000,000,000 times less conductive than copper. Excavations have shown that the Egyptian pyramids were built to house the tomb of the Pharaohs and their families. These monumental stone tombs were part of the funerary complexes of the kings of the Old and Middle Kingdoms. Their form developed from the rectangular mastaba tombs of the kings of the Early Dynastic period. The first pyramid, the Step Pyramid of Djoser, consists of six tiers that are like mastabas of decreasing size stacked one on top of the other. The Pyramids of Giza and the Nile Delta were the tombs of choice for pharaohs of Egypt's Old Kingdom. 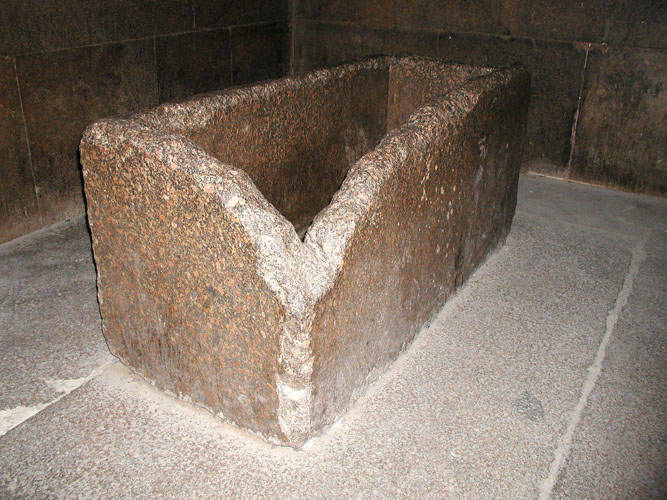 sarcophagus in the central chamber of the pyramid at Giza - From St Louis University. Because the king was revered as God, his tomb (the pyramid) was constructed to last forever, thus ensuring the continuing prosperity of the king in his afterlife. Like the early mastabas, the 4th dynasty pyramids had no decorations. The 5th dynasty (Old Kingdom) which saw the construction of more modest pyramids contained the first decorations. These decorations (Fig. 3 and 4) took the form of hieroglyphic writings - known as the Pyramid Texts - which provide guidelines and instructions on how to ensure safe voyage through the nether world and the eternal life thereafter. The contents which remain after looting and the inscriptions in chambers in the old-kingdom pyramids in Egypt provide evidence of their purpose. Electricity is actually a rather vague notion but if we take it to mean the movement of charge carriers, wireless electricity would be what we experience in lightning or in the discharge of static electricity. This sort of electricity is much less useful to us than electricity conducted in wires. Not the answer you're looking for? Browse other questions tagged history egypt pyramids . Is “Jesus” based on the Egyptian sun god Horus? Were the pyramids at Puma Punku built by humans? Which are the oldest pyramids? Does the following banner mandate wearing a hijab in an Egyptian school? Were there bears at the Treblinka Zoo?